Former assistant manager Hull switched roles with Richard Towers at the end of the previous campaign, seeing him become a boss at senior level for the first time. Hull has experience managing at youth and reserve standard but is relishing his big break at Mill Road. Mullets were one of the first teams to return for pre-season, getting back to work last month, and Hull has been busy bolstering his playing squad. 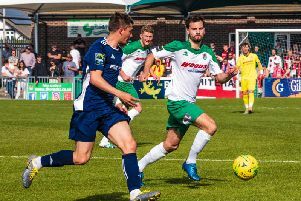 Forward Ben Gray, who has a wealth of experience at SCFL Premier Division level, has agreed on a switch from relegated rivals Littlehampton Town. Midfielder Matt Noble, having previously worked with Hull at Wick, is now a Arundel player, while Ash Hawkes completes the trio to have joined over the summer so far. Hull has been dealt a double blow with Rob Lofting and Lewis Jenkins both leaving but the new Mullets boss is satisfied with the position they currently find themselves in. Mullets’ first pre-season friendly at Sidlesham on Tuesday was called off as their pitch was deemed unplayable. Arundel are looking for opponents to play in a friendly on Tuesday (July 17). Anyone interested should contact vice-chairman Simon Butler on 077145 31367 or direct message the club on Twitter (@ArundelFC).